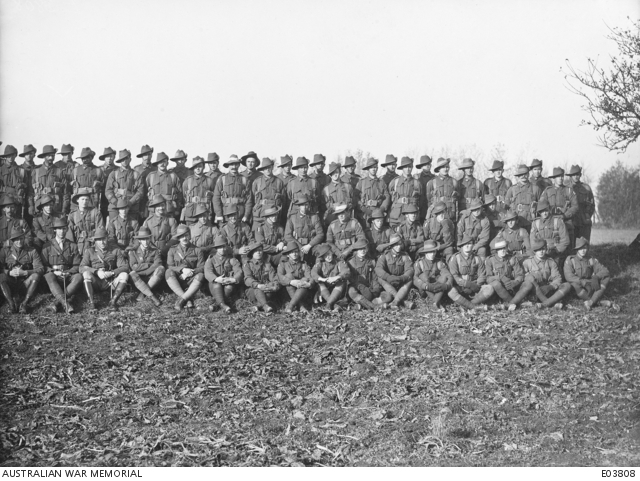 An outdoors group portrait of members of B Company of the 59th Battalion. 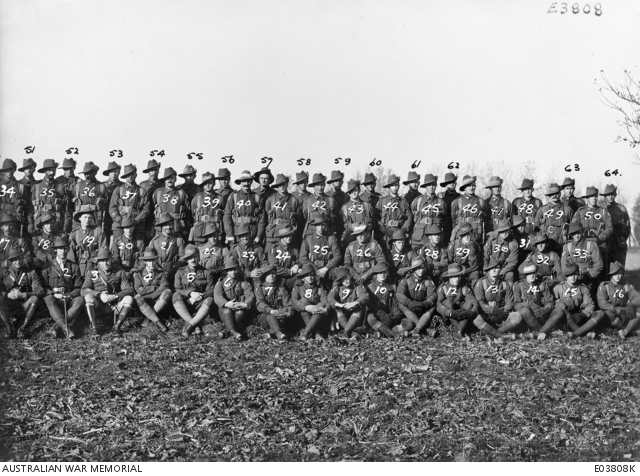 Identified: Lieutenant Colonel J J Scanlon DSO (1); Lieutenant (Lt) E A O Baker (2); Major R J Dickson (3); Lt G B Russell (4); Lt E J Greive (5); 2835 Private (Pte) C F Pepper MM (6); 3434 Pte W T Longhurst (7); 5066 Pte D S Davis (8); 2512 Pte A Miller (9); 3474 Lance Corporal (L Cpl) A L Butterworth (10); 1990 Pte N R Wilson (11); 2286 Pte A Stayte (12); 2266 Pte W Wishart (13); 2876 Pte L J Collins (14); 3008 Pte A J Scanes (15); 3414 Pte J G Jenkinson (16); 1739 Pte W H Tame (17); 2913 Pte R E Johnstone (18); 3678 Pte W Shelley (19); 6563 Pte A S Moore (20); 5449 Pte C O Skinner (21); 5707 Pte J W Lewis (22); 5332 Pte M H Beard (23); 1651 Pte H M Herdman (24); 2494A Pte A Tinning (25); 2229 Corporal (Cpl) C C Peart (26); 4713 Pte C Bell (27); 1631 Pte C W Docherty (28); 1339 Pte W Connelly (29); 2195 L Cpl T G Malone (30); 5029 Pte W G Adams (31); 3512 Cpl T W Fox MM (32); 1351 Sergeant (Sgt) A J Higgins (33); 3422 Pte E G Knight (34); 2125 Pte E W Barren (35); 2141 Pte A J Coombs (36); 1165 Pte M Evans (37); 4292 Pte C Palmer (38); 1875 Pte H Flood (39); 2253 Pte J Williams (40); 3594 Pte J F Shevlin (41); 3131 L Cpl C A Drowley (42); 3841 Pte A W Lewis (43); 4227 Pte E C Kinnely (44); 6140 Pte E J McCabe (45); 353 L Cpl F McFarlane (46); 2213 L Cpl J H McDonald MM (47); 2916 Pte E R Kennedy (48); 1938 Cpl J Murtagh (49); 1803 Sgt J Walker (50); 5171 Pte S C Parkinson (51); 6099 Pte E A Whyte (52); unidentified (53); 3403 Pte C V Hill (54); 2135 Pte G W Burnie (55); 1906 Pte H J Scott (56); 2467 Pte A T Pay (57); 296 Pte A Heywood (58); 3416 Pte L Jones (59); 3450 Pte J Murphy (60); 2174 Pte A L Howieson (61); 5208 Pte E L Stephens (62); 5209 Pte R R Stephens (63); 2504 Pte M Whyte (64). See E03808K for the position of those named in this caption. This is the right hand image in a two part panorama. See E03808P for the combined image.